Nearly half of the worldwide esophageal squamous cell carcinoma (ESCC) cases occur in China . 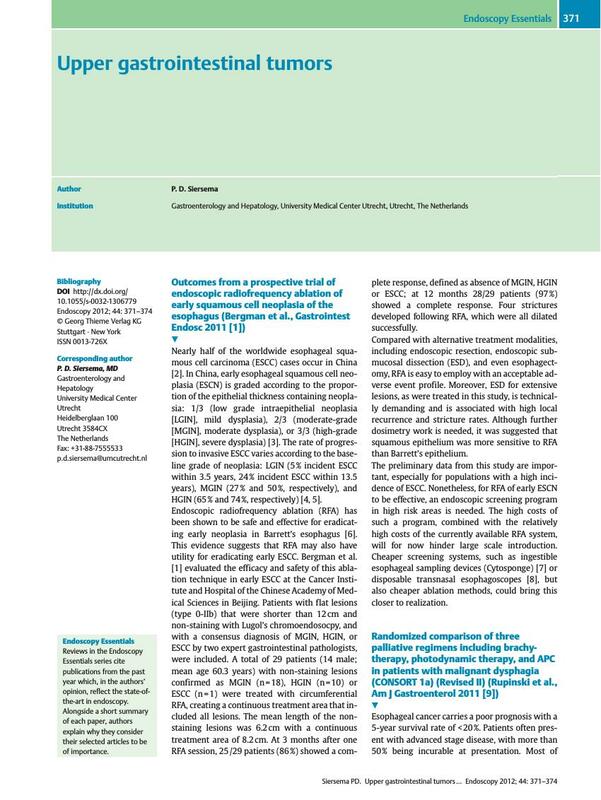 In China, early esophageal squamous cell neoplasia (ESCN) is graded according to the proportion of the epithelial thickness containing neoplasia: 1/3 (low grade intraepithelial neoplasia [LGIN], mild dysplasia), 2/3 (moderate-grade [MGIN], moderate dysplasia), or 3/3 (high-grade [HGIN], severe dysplasia) . The rate of progression to invasive ESCC varies according to the baseline grade of neoplasia: LGIN (5 % incident ESCC within 3.5 years, 24 % incident ESCC within 13.5 years), MGIN (27 % and 50 %, respectively), and HGIN (65 % and 74 %, respectively)  . Endoscopic radiofrequency ablation (RFA) has been shown to be safe and effective for eradicating early neoplasia in Barrett’s esophagus . This evidence suggests that RFA may also have utility for eradicating early ESCC. Bergman et al. evaluated the efficacy and safety of this ablation technique in early ESCC at the Cancer Institute and Hospital of the Chinese Academy of Medical Sciences in Beijing. Patients with flat lesions (type 0-IIb) that were shorter than 12 cm and non-staining with Lugol’s chromoendosocpy, and with a consensus diagnosis of MGIN, HGIN, or ESCC by two expert gastrointestinal pathologists, were included. A total of 29 patients (14 male; mean age 60.3 years) with non-staining lesions confirmed as MGIN (n = 18), HGIN (n = 10) or ESCC (n = 1) were treated with circumferential RFA, creating a continuous treatment area that included all lesions. The mean length of the non-staining lesions was 6.2 cm with a continuous treatment area of 8.2 cm. At 3 months after one RFA session, 25 /29 patients (86 %) showed a complete response, defined as absence of MGIN, HGIN or ESCC; at 12 months 28/29 patients (97 %) showed a complete response. Four strictures developed following RFA, which were all dilated successfully. Compared with alternative treatment modalities, including endoscopic resection, endoscopic submucosal dissection (ESD), and even esophagectomy, RFA is easy to employ with an acceptable adverse event profile. Moreover, ESD for extensive lesions, as were treated in this study, is technically demanding and is associated with high local recurrence and stricture rates. Although further dosimetry work is needed, it was suggested that squamous epithelium was more sensitive to RFA than Barrett’s epithelium. The preliminary data from this study are important, especially for populations with a high incidence of ESCC. Nonetheless, for RFA of early ESCN to be effective, an endoscopic screening program in high risk areas is needed. The high costs of such a program, combined with the relatively high costs of the currently available RFA system, will for now hinder large scale introduction. Cheaper screening systems, such as ingestible esophageal sampling devices (Cytosponge)  or disposable transnasal esophagoscopes , but also cheaper ablation methods, could bring this closer to realization.